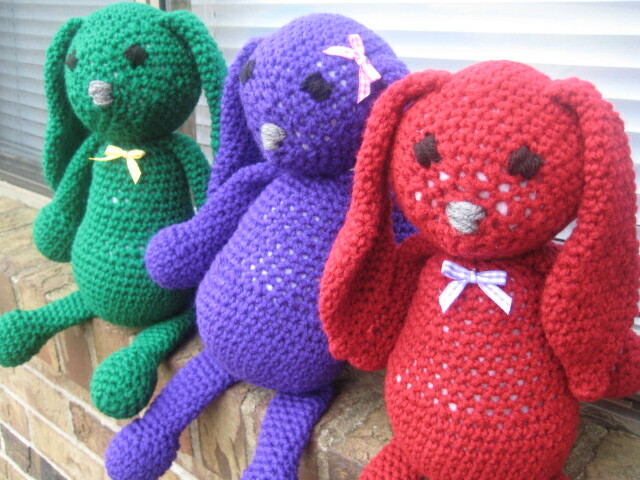 Well, this past Friday I finished all the bunnies that I had been working on. They will be donated to hospitalized children this Saturday. I am really pleased with the outcome. This was a very simple pattern from Issue 2 of Simply Crochet. I used Red Heart Sport in Vermillion for the Red bunny. 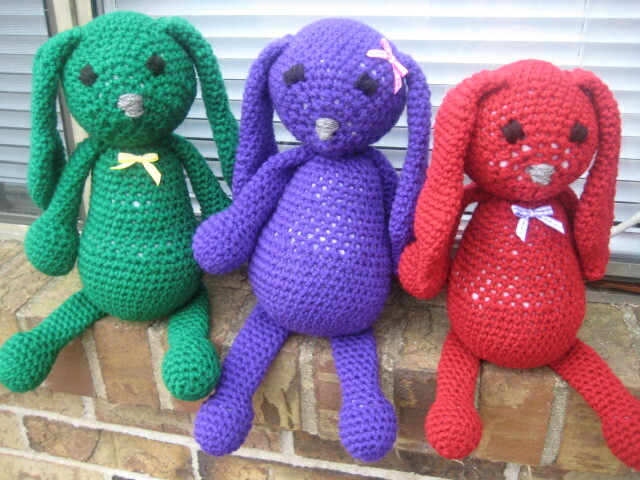 I used Red Heart Super Saver in Paddy Green and Amethyst for the green and purple bunnies. Their tails were made with Red Heart Super Saver in Light Grey. The eyes and nose were embroidered with scrap yarn of Red Heart Super Saver. The hook size used was 4.5 mm. If I were to make them again, I would go down a hook size to avoid the stuffing peeping through. I had planned on sewing little vests for them but, the deadline date was pushed up. Therefore, I decided to just adorn these bow ribbons that I had purchased from Hobby Lobby a few years ago. Overall, I am pleased with the results. Well, today I finally finished all the parts for the bunnies that I am making for charity. Now, I just need to stuff, assemble, and then embroider the face. 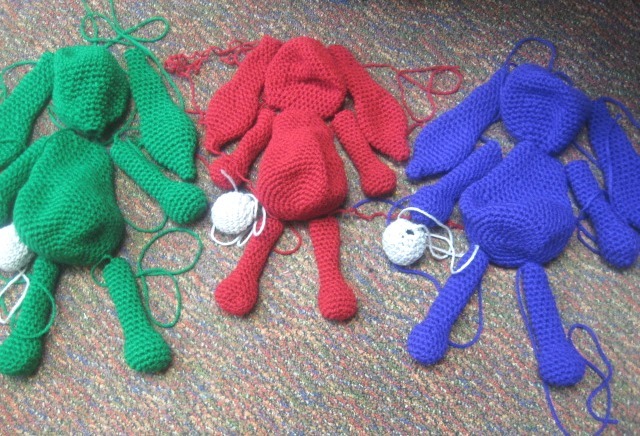 While working on the red bunny’s parts I ran out of yarn. I then joined some more yarn and noticed that the shade was off and that the yarn was thicker. I then realized that I had been working with Red Heart Sport yarn in Vermillion and not the Red Heart Super Saver in Burgundy. So, I literally raided my stash searching for another skein of the Red Heart Sport in Vermillion. 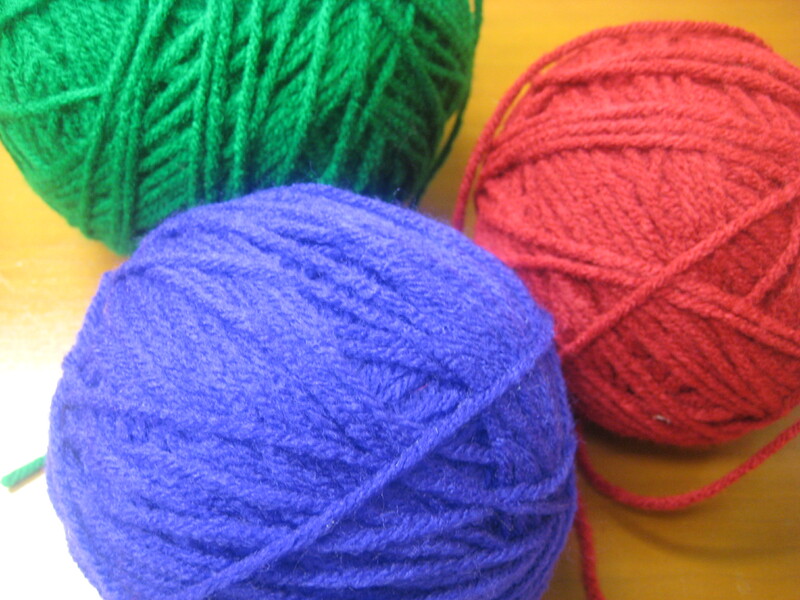 (OAN: I didn’t realize how much yarn I had.) But, I did not find it. By that point, I had finished the head, the body, and 1 ear of the bunny. I started thinking of just starting over in the Red Heart Super Saver in burgundy but, I really did not feel like it. So, then an idea popped in my head! I remembered this top that I had made out of the exact same dye lots of the Red Heart Sport. I never wear this top because it fit kinda big and once I would sit down it looked horribly rumpled when I stood up. So, I ripped it! Now I had the yarn I needed and the problem was solved. So, if you look closely at the picture, you will notice that the red bunny is slightly smaller than the green and purple bunny. The bunnies’ tails are showing up as white in the picture but, they are actually the light grey in Red Heart Super Saver. I am thinking of doing black eyes and a deep grey nose. I’ll do a post on the finished products before they go to their new homes. 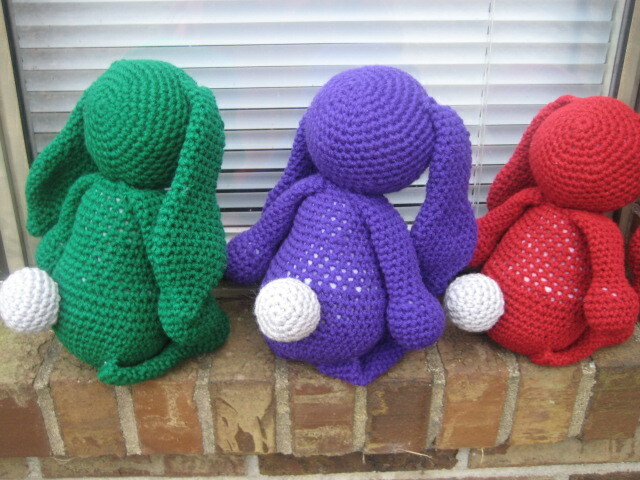 Yesterday, I mentioned in a post that I would be making 3 bunnies to donate to children for Christmas. Well, I think I am set on these colors for the bunnies. I am still a bit iffy about the purple but, it may work. I like the idea of going with jewel tones because I didn’t want to go the pastel route. The reason for this is because I want to avoid the bunnies looking like an Easter theme considering people associate pastel bunnies with Easter. I plan on starting these tonight. I’ll keep you posted. 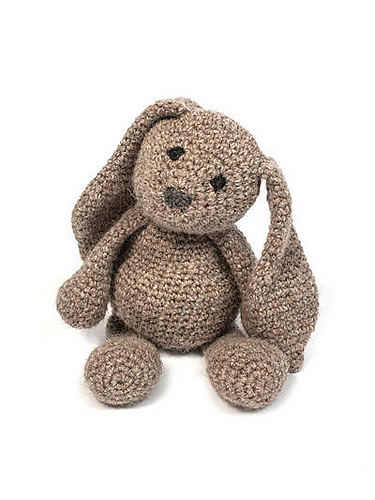 Even though I promised myself I wouldn’t be doing any Holiday knitting or crocheting this year, I agreed to create some stuffed bunnies for children who are hospitalized for Christmas. 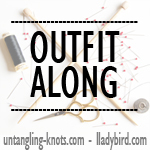 Honestly, I really have to squeeze this in because I am in the process of applying to graduate school, finishing up a pattern for a lady in my knitting group, and finishing up a baby vest (yes, I am still working on that same baby vest). The good thing is I put the final touches on my cardigan that I was pattern testing for Andi so, I don’t have to think about that. I plan on making 3 bunnies and I will be using Red Heart Super Saver from my stash. I am not sure what colors I will be using yet. 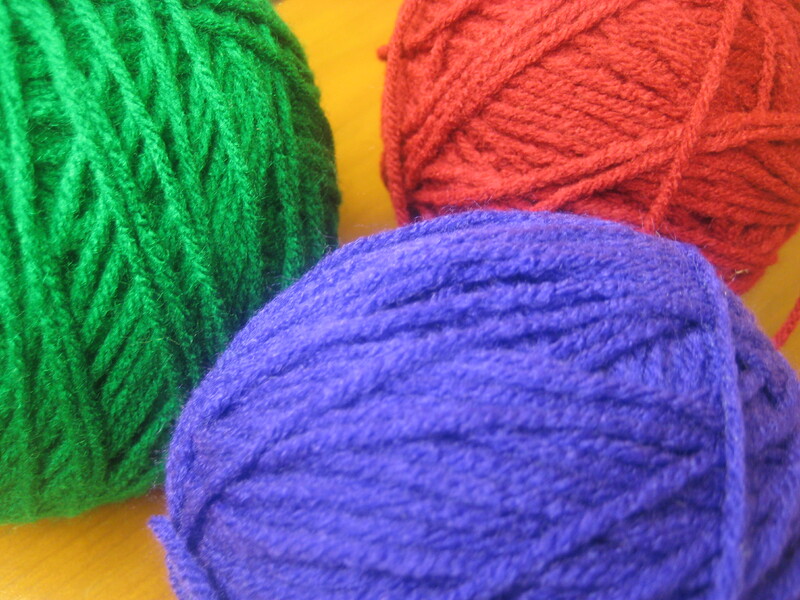 Maybe variegated or solid colors in jewel tones. But, I will figure that out maybe tonight after church. I plan on embroidering the eyes and nose as pictured so, that it can be safe for children of all ages. My plan of action for these bunnies is to create all the parts first. Usually, I will make the full bunny and then move on to the next bunny and so on. However, to stay on task I figured that I need to create all parts for the 3 bunnies, then stuff, then assemble. Kind of like an assembly line. This pattern is from the Simply Crochet, Issue 2. It calls for DK weight yarn but, I plan on using Worsted weight. I don’t think it really matters because it should still be a nice size stuffed animal for a child. I’ll keep you posted on how these turn out. OAN: I finished my cardigan and it looks so nice so far. The ends are weaved in and I will be blocking tonight. Expect a post in the next day or two with the final result.